In an article published last week, I argued that the American indie studio Supergiant is worthy of their prominent status among indie developers, providing unique worlds and gameplay that are rarely rivaled throughout the gaming industry. That article has plenty of justification behind that claim, but to specify further, their first title Bastion changed my stance on the gameplay capabilities of isometric titles and their follow-up Transistor remains one of the best cyberpunk stories told across any medium. So, to say that their upcoming title, Pyre, was on my radar was certainly an understatement, as they combined their usual flair for artistic and well-developed worlds with another personal favorite of mine, arcade sports-style action. Featuring gorgeous environments, stellar writing and a memorable cast of characters, Pyre is yet another thoughtfully-crafted title from the minds at Supergiant, even if the gameplay doesn’t quite have the legs that the game seems to believe it does. Pyre’s premise is an uncommon one, as the player personifies the persona of the Reader, who themselves an exile from the main city of Commonwealth, must lead other exiles through the dangerous lands of Downside. This summary only scratches the surface of the world within Pyre, as the optional dialogues and readings are packed with lore, relationships and emotions that make for a compelling and relevant story, further benefited by a Twine-style mid-conversation system that helps the player keep track of the vast and complex world. 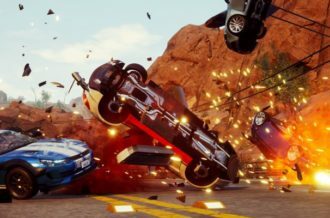 The characters are what will stick out, as both friends and foes alike are given engaging personalities that will make you laugh, ponder and care about the variety of beings on-screen. While the world boasts many opportunities to make decisions regarding travel and dialogue, the vast majority of them are minimal in impact, and the major ones, while intriguing, are too few and far between to inspire any sort of necessary replayability. 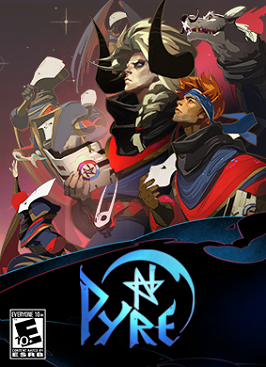 The twelve-hour length does create droughts where both the character and plot progression can be somewhat lacking, due to a increasingly repetitive gameplay structure as the game moves forward, but as a whole, Pyre’s story is captivating and one of the best the year has had to offer so far. 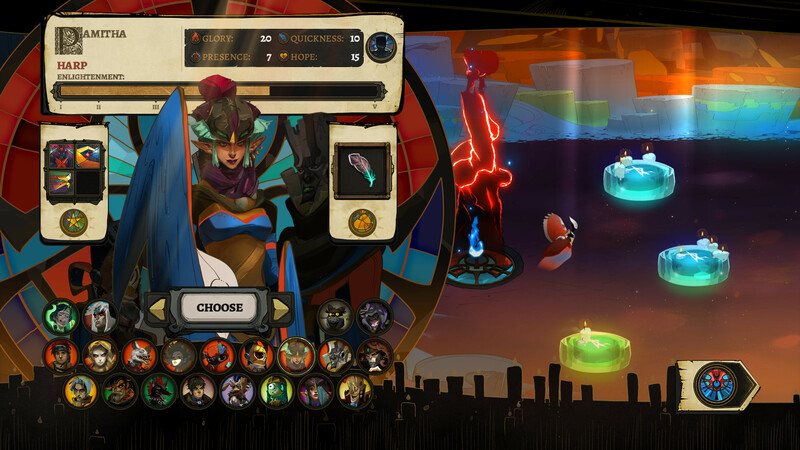 From a gameplay perspective, Pyre offers an equally unparalleled experience, as the party is forced to compete in arena battles known as Rites, wherein teams of three must deliver a Moon Orb to the opposing team’s flames and ultimately extinguish it, granting them a shot at a potential escape from Downside. Each party member has their own style of movement, both on and off the ground, as well as attacks, as those that are not holding the orb can either run their protective auras into their opponents or shoot it forward long distances. 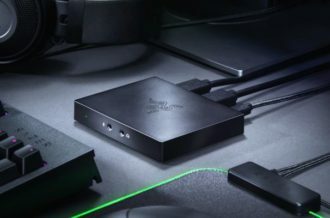 To save the player any control-based headaches, only one member of each team can move at a time, which spurs the need for some interesting strategies as the one-on-one matchups are constantly changing both in and out-of-favor for each side. 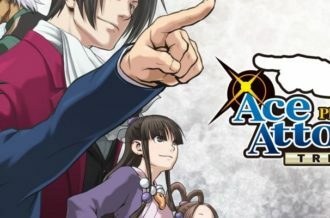 Unfortunately, once the party is filled out and a preferred trio is chosen, the remainder of the game feels much more repetitive, as higher stakes aren’t enough to overcome the familiar pre-match routines, nor do the rotation of opposing teams require any sort of change in approach, as the difficulty level for matches often feels too low to frequently cause any real amount of concern. 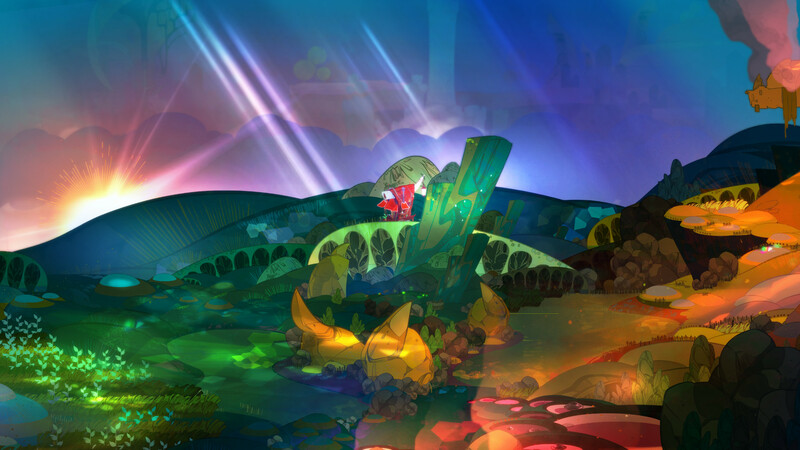 For as gloomy and desolate as a land like Downside should be, Pyre is instead packed with jaw-dropping environments, filled to the brim with colors and details that make the world more beautiful than a purgatory-like location has any right to be. Plus, just like the Supergiant games before it, Pyre features narration from Logan Cunningham, this time playing the hero-hating announcer of Rites, and music from Darren Korb and Ashley Barrett, whose moving soundtrack provides glimmers of hope for a team that is fighting to hold onto their past lives. Technically, the game is rather sound, with only a few instances of frame drops and grammatical errors to speak of. 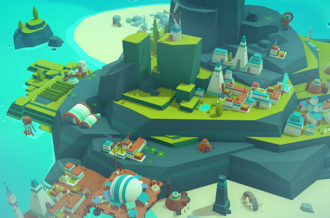 In addition to the campaign, Pyre offers a local versus mode, which grants access to a wide roster of characters, many of which are unplayable in the main game. While it runs as well with others as by itself, the Rites are too complex to offer any sort of pick-up-and-play appeal, with more joy likely arriving from playing with other experienced Pyre players (which makes the lack of any online compatibility all the more disappointing). Pyre represents another solid effort from Supergiant, as the awe-inspiring world, both in terms of design and depth, coupled with a lovable cast of heroes and villains, continue the studio’s renowned streak for titles with big heart and unique gameplay. 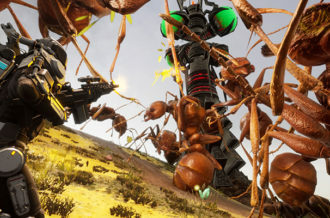 The repetitive and overly-lengthy nature of the campaign, as well as a lackluster versus mode, holds the title back from reaching the same heights as its predecessors, but those looking for an original universe and an uplifting tale will be hard-pressed to find a deeper and better-looking game this year.